My last visit to Samuelson's Rocks was in 2013 (click HERE for that trip), so I decided it was time for a return visit. "Who knows," I thought to myself, "I may find an undiscovered rock ala Samuelson." That would be pretty darn cool. The weather was perfect, the air was crisp and clean, my parking spot was open and the desert sand was scrunchy. Gathering my possibles, I set out to see what I could find. It's a little over 1-1/4 miles from the parking turnout to the mound of rocks that Samuelson spent hours and hours upon, finding suitable rocks for his inscriptions and then chiseling them into their flat surfaces. Did he spend some nights atop his rockpile? No one knows for sure, but I'll bet he did. Maybe that's where he got the inspiration for his carvings. And that bedframe? Maybe that's where he slept. So, how to get to Samuelson's Rocks? The GPS says go southwest. But from what starting point? Well, a little research will divulge that, so no need for me to make it too easy. But here's a great landmark to use. See that vertical line of rocks nearly in the middle of this image? That's a perfect point of reference that I use to find my way to the rockpile. So, I commenced hiking. There are quite a few fallen giant in this area. If you're ever tempted to use fallen Joshua Tree wood for firewood, don't. It's against the law in the park. Something new I started experimenting with on this trip, taking my crystal ball along on hikes in the desert. If I get lost, I can always consult it for directions. One caveat of crystal ball photography during daylight. The ball can act like a magnifier, focusing a very concentrated, hot spot of light onto your hand. Ouch. Had to take these shots pretty quick. 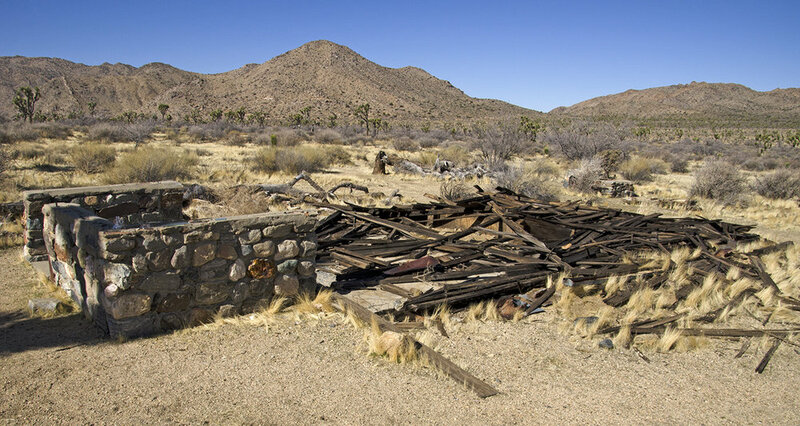 My favorite spot along the hike to Samuelson's Rocks is a long abandoned homestead. Did this car once belong to the owner of the nearby cabin ruins? Possibly. Who owned the cabin ruins? Samuelson? When was it built? 1927? My crystal ball provided no answers to these and other important questions that came to mind while wandering in the desert. One of the many old roads of the park passes near this lost homesite. I think this may have been a driveway gate that could have been used to block access to the ranch. My guess is that the stone section of this ruin was the entrance to the home, with the main portion of the cabin being built behind it. The coolest thing, this cabin had a basement. I can't think of any other historic structure in the park having a basement. So, the next question, did I go down those steps into the dark unknown? Does a coyote poop in the desert? 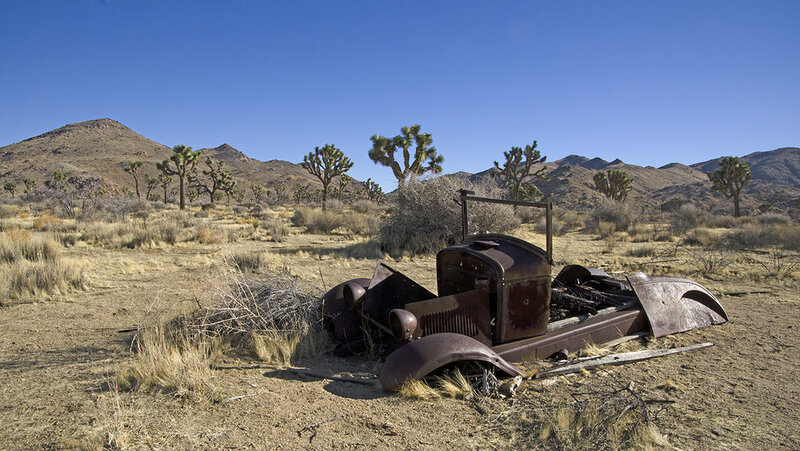 Do Joshua Trees move around at night? Did I toss a stick down there first to see if anything rattled? Yes. It's apparent that a lot of work went into the building of this cabin. I'd love to find a picture of it before it fell to pieces. Okay, time to get out. I need to pack a face mask to use when exploring places like this. Was this an outdoor oven? There are no mines that I know of in the area, so I doubt it was used for smelting. Maybe someone has an idea. Leaving the homestead, it was less than 1/4-mile to the rockpile. The rockpile isn't very big, measuring approximately 180 yards long by 100 yards wide. Note my navigation landmark just to the left of the Joshua Tree on the right. I headed over towards the west end of the rockpile to see Samuelson's signature rock. WITHOUT THEM. WE. BE. NOTHING. The Faith Rock is the only rock that Samuelson signed his name to. It is also the only rock at desert floor level. I wonder if it was the first one he inscribed. I haven't heard of information regarding the order in which the inscriptions were created. FOR A FAT RAKE OF AND HIS FREE KEEP’S. HE DIGS IN YOUR POCKET. This rock is up the pile a bit. All in all, I've found eight inscriptions. Rock #4 on my list. Looks like Samuelson admired Henry Ford. Judge Benjamin Barr Lindsey was an American judge and social reformer based in Denver, Colorado during the Progressive Era. John Samuelson's bed. Okay, I don't know if that's true or not, but I like to think he spent many a night resting upon this frame, gazing up at the stars while his mind wandered and composed his next rock carving. To the best of my knowledge, this is the only standing and intact corral in JTree. Evidence of a bygone time when cattle actually grazed in the area. A rancher by the name of Oliver Smith grazed Texas Longhorns in this are between 1870 and 1876. This corral, however, probably dates from between the 1920s through 1940s when local homesteading was beginning in the area. There's a pumphouse out there, if you know where to look. The pump works and brings water up from somewhere deep in the desert. I haven't tried drinking it though and wouldn't recommend anyone do so. Part of the old fence that kept cattle in their place. After traipsin' around the corral, I headed back to the rock pile to find the last couple rocks. This rock is a bit above the desert floor, on the northwest side of the rockpile. A bit of scrambling gets you to this vantage point. MOST OF IT WE MAKE. OUR SELFE. This is a tough one to spot, and a tough one to get to. Be smart and take the long way. I didn't get a closeup of it the last time I visited. Notice the corral in the background, that should help you find this one. THE PRESENT DAY RELIGION AND GOVERNMENT. HARDEST GRANIT INTO A POWDERED SAND. So, I knew that Quail Springs was out there somewhere in the distance, and that it had something interesting to see. Should I go look for it? The day was still early and the fact that I didn't have the coords shouldn't deter me. Or should it? How far could it be? From atop the rockpile, looking back northeast towards my parking spot. It was reassuring that I could see GrayTac. Be sure to check out Murbachi's pages on this area, by clicking HERE. 3D glasses make it even more interesting, but aren't required.